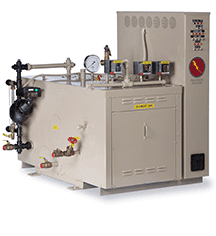 Precision steam boilers provide high quality steam, when you need it, where you need it, every time you need it. Whether the application requires high-pressure process grade steam, low-pressure hydronic steam for comfort heating, or ‘clean’ steam for humidification or sterilization, Precision will deliver a reliable and efficient solution that system engineers and facility owners will appreciate. Our steam boilers are manufactured to stringent industry standards and designed to fit a wide range of applications. They are available in both electric (ST and STH series) and fuel-fired (FPS and FTS series) boiler designs that can be customized to comply with most any specification. 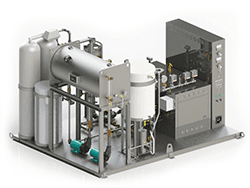 Our unique skid packaged steam systems are custom designed, fabricated and factory-tested by Precision to minimize field installation time and expenses. 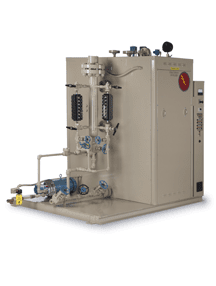 Our steam boilers are commonly used for space heating, sterilization, humidification and process steam. Despite its compact footprint, the Model ST’s large steam chest delivers high quality, dry steam with minimum carryover. 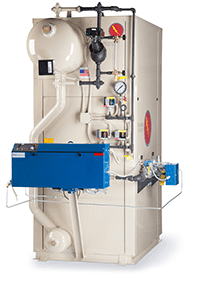 Fuel-oil or propane boiler retrofits are simpler with a Precision Model ST that requires no vent stack or combustion air louvers and can be supplied in a ‘knock-down’ condition to fit through narrow entries to the old boiler room. The standard ST models can be customized with a variety of factory installed options or configured to connect with field mounted interfaces, giving you exceptional flexibility in design and specification. Adding an SCR creates a boiler with 100:1 turndown to precisely follow the process demand. Traditional vertically configured fire-tube design with better over-all efficiency due to a bottom-fired power burner. In addition to the simplicity of the 4-piece design, the FPS includes many advantages over other vertically configured boilers, including: large water volume and steam chest that reduces cycling, and an internal feedwater pre-heater to improve overall efficiency and reduce the risk of thermal shock. Flex-tube forced draft design offers high fuel-to-output efficiency in a compact, maintenance-friendly design that harnesses natural heat convection to ensure consistent internal heat distribution and complete internal feedwater circulation. The upper steaming chamber is connected to the lower feedwater return vessel via individual serpentine configured carbon steel tubes, to form a 5-pass heat transfer area of 5 sq. ft. per BHP. Separate down-comers connect the upper and lower vessels outside the boiler cabinet to optimize natural circulation and heat transfer. 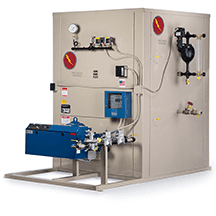 When specification calls for higher pressure process steam (> 200 psi operating), the STH delivers high quality process steam in a compact footprint. Custom models can be supplied in a ‘knock-down’ option to fit narrow entries. Optional SCR control provides near infinite modulation to precisely follow heating load. Requires no vent stack, breeching, or combustion air louvers. The STH is perfect for high pressure process steam installations, and saves time and money, with no need for custom ventilation. A one-stop shop for virtually anything your boiler room requires.